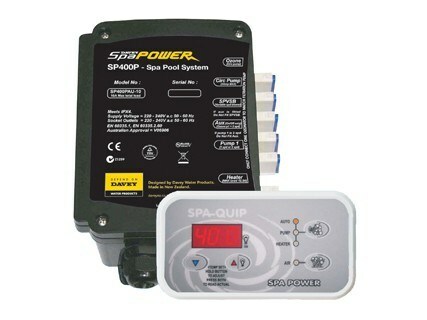 Ideal for retrofitting to older spa’s, the SP400 range features a detachable element which allows the controller to be mounted in small confined spaces. Using Davey SpaPOWER technology, the SP400 range is available with a 10 or 15amp compatible supply, with a choice of rectangular or oval touch pad, supplied separately. Also available – 1.5kW or 2kW heater with an optional time clock.